Early Wynn was known as one of the most intimidating pitchers in baseball. He was known as the “headhunter” because he wasn’t afraid to throw a pitch at anyone. Mickey Vernon was said, “He (Wynn) hated to have anybody bunt or hit one up through the middle. If you did that, he’d knock you down the next time up.” Wynn batted both left and right and hit right. His win-loss record was 300-244 and he had an ERA of 3.54 and 2,334 strikeouts. Early played in 290 complete games, and had 49 shutouts. Wynn’s debut was with the Washington Senators. His last appearance, exactly 24 years later, he was with the Cleveland Indians. From 1955 to 1960, he was a six-time All-Star selection. In 1959 he won the Cy Young Award and the AL Pitcher of the Year. 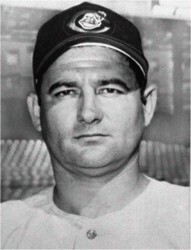 In 1950, Wynn had his first 20-win season, with a total of 5 throughout his career. He signed with the Senators at age 17 with only 3 appearances. While he was with the Cleveland Indians, he was part of one of the greatest pitching rotations, along with Bob Feller, Bob Lemon, and Mike Garcia. In 1954, while he was with the White Sox, he had a 2.73 ERA, won 23 games and struck out 155 batters. In his career, Wynn batted .214 with 17 homeruns and 173 RBI with 90 pinch-hit appearances including a grand slam. In 1977 to 1980, Wynn was the color commentary for radio broadcasts of Toronto Blue Jays. In 1972, he was inducted into the Baseball Hall of Fame. He died in Venice, FL in 1999.